The Hopkinson Report » Episode 80: Interview – Auto-Tune the Podcast with The Gregory Brothers. « Episode 79: Interview – The Roger Smith Hotel is like a mint on your social media pillow. Episode 80: Interview – Auto-Tune the Podcast with The Gregory Brothers. That’s how The Gregory Brothers describe their series of videos, Auto-Tune the News. I’ve been following the series for months now, and tweeting and forwarding them to anyone looking for funny entertainment at the intersection of pop culture, music, and technology. 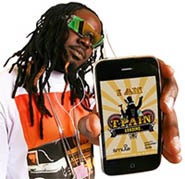 # 2)Â Modern artists like T-Pain have brought it back big time, not only with award-winning songs, but also collaborating with Saturday Night Live for their popular digital short “I’m on a boat,” with Jimmy Kimmel for skits on his show, and he has an iPhone app called “I am T-Pain.” More on that in a second. # 3) A Brooklyn-based band called The Gregory Brothers have made a hilarious string of viral videos called “Auto-Tune the News,” which mix political and pop culture news footage with a poppin beat and a happenin’ bass line, all set to Auto-Tune. I interviewed Andrew, Michael, and Evan on the podcast. Auto-Tune the News #2 is one of my favorites, and the original where Katie Couric utters the now-famous line “Very Thin Ice.” As you’ll see, the brothers superimpose themselves into the newscasts, wearing outfits ranging from hip hop garb to an angry gorilla. As a service (torture) to my readers, I show how Auto-Tune can take a hopelessly horrible singer like myself, and at least give you a laugh. Play the podcast to see how my opening intro sounds after running it through T-Pain’s Auto-Tune iPhone app. Additionally, I was very curious to see what exactly made for the best Auto-Tune effect… was it the person’s voice, their inflection, their pacing, certain words, or certain vowels?Â The Gregory Brothers answer that in the interview, but I also extended it to songs. What I found was that the higher the voice, and thus the more you sang out of key, the better the Auto-Tune. As a bonus, I conclude the podcast by singing a line from my top pick, so brace yourself. My all-time favorite thus far is definitely Auto-Tune the News #8. The Gregory Brothers, along with Evan’s wife Sarah (who is also part of the band), masterfully tie in the opening “Made in America” theme across topics as diverse as Michael Vick’s comeback and the geese problem at airports. Unintentional singers include ESPN’s Scott Van Pelt, VP Joe Biden, and Katie Couric’s replacement Maggie Rodriguez (still a fine shawty). This entry was posted on Thursday, November 12th, 2009 at 4:46 am and is filed under Interviews, iPhone, Pop Culture / Entertainment. You can follow any responses to this entry through the RSS 2.0 feed. Both comments and pings are currently closed.